Q. Given the current political environment, it's clear that Americans are interested in supporting brands that have deep engagement with a relevant social issue. I'm curious how you see nonprofits fitting into this conversation. Beyond being a partner for these brands, how should nonprofit organizations engage in discussions around current events through their own communications (and is it appropriate for them to do so)? Do you have thoughts on this? Are people looking to nonprofits for this kind of guidance? Or is this territory we should avoid? Second, when you say: I feel like we have the opportunity to provide nonpartisan resources for our followers/subscribers in response to current events you're talking about NEWSJACKING (aka when organizations align themselves with breaking or trending news to build awareness - or even to raise money, which I call CAUSEJACKING!). I think newsjacking is an excellent idea and more nonprofits should use it. Again: you can inject yourself into breaking and trending news without being controversial! Also, look for stories that are unique to your community. For example, when an ambitious raccoon scaled a skyscraper last summer in Minneapolis and captured the mediaâ€™s attention, an enterprising organization pounced on the opportunity! They created two tee shirts to sell and portion of sales benefited a wildlife organization. This article is also helpful and mentions the main proponent of the practice, David Meerman Scott. Finally, Iâ€™ve devoted a whole PInterest board to examples of newsjacking and â€œcausejackingâ€� (When you ride the wave of a breaking story to raise money!) Check it out! Good luck! 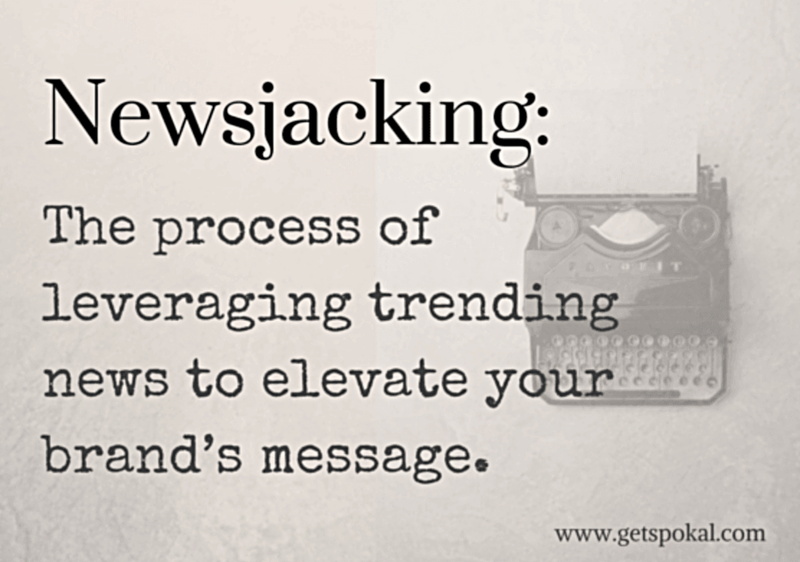 Is your nonprofit using newsjacking to elevate your brand? Iâ€™d love to hear about it! 1. There are many types of corporate partnerships. But the best ones involve partners that are "all in". Take the example of Coca-Cola's partnership with World Wildlife Foundation to raise $10 million to ensure the polar bearâ€™s future. 3. Ok, here's the situation. A corporate leader is addressing a large conference audience and wants to activate the audience to support your cause. Her question for you: How do I do it? Check out how this company invested 15 minutes of a keynote presentation to fundraising and raised $30,000 for its nonprofit partners. 1. If you work with influencers - and you should - here are 9 best practices for influencer marketing agreements. 2. Marketers agree. The marketing channels that return the highest ROI are email marketing, SEO and content marketing. 1. Must read: Jamal Khashoggi's murder amounts to a bloody, brutal dare to the CSR community. 2. Blue and red companies: how CEO activism is reshaping workforce politics. 3. For the first time in its corporate history, outdoor retailer Patagonia endorsed 2 Senate candidates.